Getting a good custom recovery on your Android device is one of the first steps you need to take to customize it. Having a custom recovery will allow you to flash and modify your device. It will help you root your phone, create a backup of your system, wipe your cache and dalvik cache, among other things. The two most common custom recoveries are ClockWorkMod (CWM) and Team Win Recovery Project (TWRP). Both recoveries are good but a growing number of people are favoring TWRP because it is said to have the better interface and it frequently updates. TWRP has a complete touch interface. Tapping on-screen buttons allows you to access all of its features. TWRP is easy to use and available for most Android devices and Android versions. The latest version is the TWRP 3.0.0. In this guide, we’re going to be showing you how you can flash TWRP 3.0.0 or 3.0.x on your Android device. We will show you three different methods you can install this version of TWRP recovery. The first version uses the TWRP.img file, the second uses the TWRP.zip file, and the third is for Samsung Galaxy devices using TWRP.img.tar file. This guide is for almost any Android device from manufactures such as Sony, Samsung, Google, HTC, LG, Motorola, ZTE and Oppo. TWRP recovery is for devices running on Android Jelly Bean, KitKat, Lollipop and Marshmallow. Make sure that the TWRP 3.0.0 or 3.0.x file that you download is the right one for your device and Android version. Charge your phone to 50 percent to avoid running out of power before recovery finishes installing. Have an original data cable that you can use to establish a connection between your smartphone and your computer. Disable your computers firewall and any Antivirus programs first. You can enable them again after the recovery has been flashed. Enable USB debugging on your device by going to Settings>About Device and tapping the Build number 7 times to enable Developer Options. Go back to Settings, find Developer Options, open it then enable USB debugging. If your device had locked OEM permission, unlock it. You can easily flash this file on almost any device as long as it has TWRP recovery.img support. Setup Android ADB and Fastboot on a PC and use it to flash the file. You can also use an app such Flashify or Flash Gordon but only if you have root access on your device. Install and setup Android ADB & Fastboot onto a PC. Download the right TWRP file for your device. Rename to TWRP.img. Copy downloaded TWRP Recovery 3.0.x.img file to ADB and Fastboot folder. If you have the full ADB & Fastboot installation, copy file in installation drive i.e. C:/Android-SDK-Manager/platform-tools. If you have Minimal ADB & Fastboot, copy file in C:/Program Files/Minimal ADB & Fastboot. Now open platform-tools or Minimal ADB & Fastboot folder. Press and hold shift key then right click on any empty area in the folder. A menu will pop up. Click option “Open command window here”. Download the recovery.img file from the same the link above. Rename to TWRP.img. Copy downloaded recovery.img file to phone’s internal or external storage. Open the Flashify application on your device and give it root access. Tap Recovery Image Button, and find the file you copied in step two. Follow the on-screen instructions to flash the file. This will work with most Android devices as long as you have custom recovery. The second method we have here also needs root access. DownloadTWRP 3.0.x Recovery.zip for your particular device. Copy downloaded file to phone’s internal or external storage. Boot phone into custom recovery. 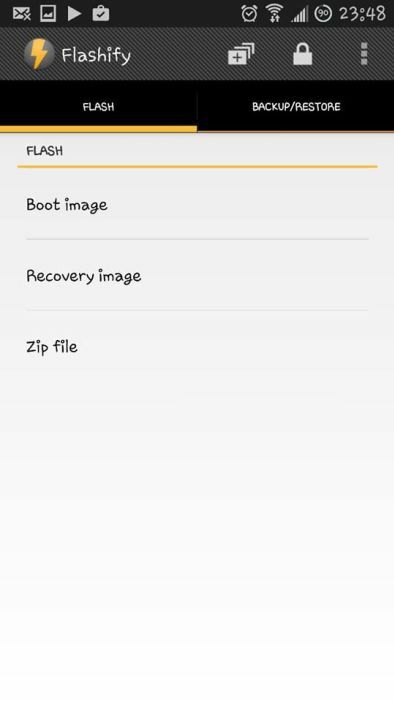 In custom recovery, select Install / Install Zip from SD card > Choose Zip form Sd card / locate the zip file > Select the TWRP recovery.zip file > flash the file. When flashing is through, reboot into recovery mode. Download the recovery.zip file from the same the link above. Rename to TWRP.img. Copy downloaded recovery.zip file to phone’s internal or external storage. Download TWRP 3.0.x Recovery.img.tar file for your device. Download and install Samsung USB drivers onto computer. Download and extract Odin3 on your computer’s desktop. Put your device in download mode. Turn it off completely turn it by pressing and holding the Volume Down ,Home and Power buttons. When you see a warning, press Volume Up. Connect phone to PC and open Odin3.exe. You should see a yellow or blue light in ID:COM box, this means that your device is successfully connected in download mode. Click PDA/AP tab and select recovery.img.tar file. Make sure the only options that are selected in your Odin are Auto Reboot and F. Reset time. Click the start button. Flashing will begin. When flashing ends, your device should automatically reboot. Have you installed the latest version of TWRP Recovery on your device?